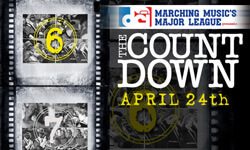 Drum Corps International's "The Countdown" comes to more than 300 movie theaters across the country this Thursday, April 24 at 7:30 p.m. local time. With only days left in the "countdown" to Thursday's event, many theaters are beginning to fill up. Don't get left standing out in the movie theater parking lot on April 24 without a ticket! Bring yourself, bring your friends, bring your coworkers, bring your old drum corps pals, and order your tickets in advance today! Order tickets online through FathomEvents.com.